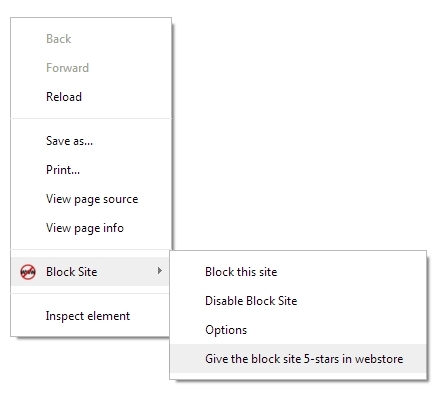 Block Site for Chrome Has Some New Cool Features. That's what I call interesting article. Add the forward website, when accessing the blocked one, import/export your settings and more. Whether you are using BlockSite for Chrome for a long time or you are a new user you are curious about new features that has been added to BlockSite. If you don't have BlockSite add it to your Google Chrome here. We are continually improving Blocksite from our ideas and mostly from ideas from our users. You can submit your idea via this website and we will be really happy if you do. You might be looking for an icon which was next to the address bar. According to our stats the icon wasn’t used by many users so we decided to save some place in the top bar for you and add all the functionality in the context menu. The main reason is that the pop-up from icon was usually quite delayed, which was caused by Chrome and the Context menu is much faster and more accessible. How do you access options now then? · Disable BlockSite – do you need to disable functionality of BlockSite for a while? You can do it quickly here, without losing your data or uninstalling the extension. · 5-Star review - We are happy to read your comments about BlockSite. You can suggest some functionality with a 5 star review. We are reading them quite often. You can now add a forward page, where do you want to go when you access the blocked site. You can add this forward page to every blocked site in Black List. In the white list you can add a default redirect page, where every visit on the blocked website will be redirected to this one page. If you need to reinstall the extension or you need to batch import your blocked websites you can do it now. Just upload a CSV in the format: BlockedWebsite, Forward website, each on one row. If you are happy to see those changes or you have something more you want to add to this extension, please leave a 5 star review with a comment in Chrome webstore. We will go through them and add more functions as soon as possible. Get the best out of this extension and find out how to suggest new features. We are still adding new functionality and we would like to hear your opinion. Austin, Texas, January 22, 2013 - The Austin based YouTube channel Psychetruth has released a free website extension for Google Chrome and Firefox that allows users to be instantly notified of new uploaded content.